Handling your Flower Centerpiece: Following some basic flower care tips, will greatly help in maximizing the vase life of your flower centerpiece. Your flower centerpiece will arrive direct from the farms in South America, with a quick stop in our facilities in Miami, then shipped directly to you overnight via Fedex. We do this to ensure that the flower centerpiece you receive arrives at its freshest possible. Our flower delivery cycle eliminates middlemen that cause tan over handling of flowers that both decreases the vase life and quality of the flowers you receive. The less you handle you fresh flower centerpiece the longer it will last. 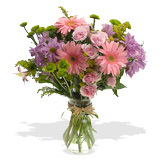 So make sure you remove your fresh flower bouquet from the box, immediately upon arrival. Recut the flower stems at the point shown, removing the foliage below the water level and place your fresh flowers in the vase to create a perfect flower centerpiece a beautiful compliment to any table.